The Bank Of Khyber (BOK) Sindh-Khyber Pakhtunkhwa. Maximum Age: Up to 50 years relaxable in case of a candidate having the extraordinary track record. Qualification: Minimum education required is MBA, MA in Economics, M.Com or any other equivalent related degree from an HEC recognized University or reputable foreign university. (Minimum qualification graduation in case of candidates with the extraordinary track record). Minimum Experience: 05 years of overall banking experience of which 02 years should be as Branch Manager at a Bank. Maximum Age: Up to 35 years relaxable in case of a candidate having extraordinary track record Qualification: Minimum education required is Bachelors from an HEC recognized University or reputable foreign University. Minimum Experience: 05 years of overall banking experience of which 02 years should be as Manager Operations. Maximum Age: Up to 40 years relaxable in case of a candidate having the extraordinary track record. Qualification: Minimum education required is MBA, MA in Economics, M.Com or any other equivalent related degree from an HEC recognized University or reputable foreign university. (Minimum qualification graduation in case of candidates with the extraordinary track record). Minimum Experience: 02 years of experience in Trade at Commercial Bank. Maximum Age: Up to 40 years relaxable in case of a candidate having the extraordinary track record. Qualification: Minimum education required is BCS/BS/BIT/MBA/MPA or any other equivalent degree from an HEC recognized University or reputable foreign university. Additional Certification/Degree will be preferred. Minimum Experience: 05 years working experience as Business Analyst in a Financial Organization with good knowledge of Internet / Mobile Banking, Contact Center, Risk, Consumer, Compliance, Finance, HR, CPU, Cash Management & Swift. In case the degree is obtained from a foreign University, equivalency certificate from H EC is to be submitted by the candidates at the time of interview to validate that they possess the required education. 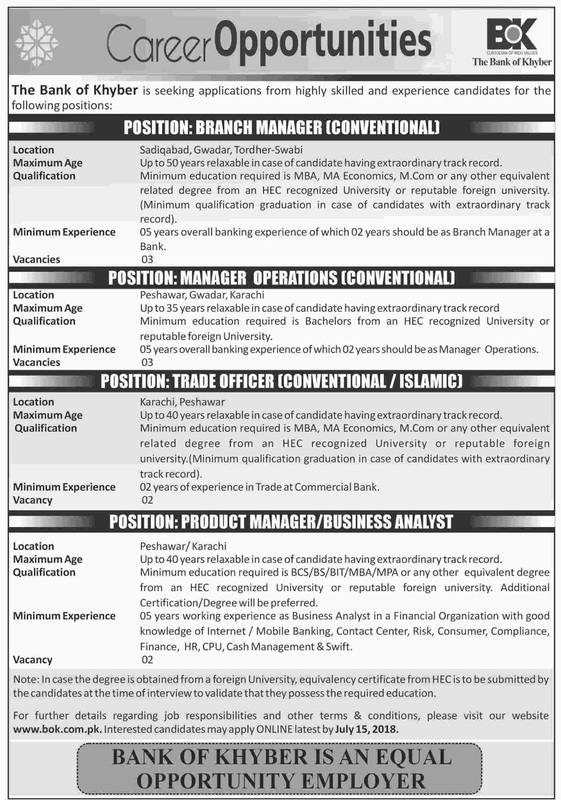 For further details regarding job responsibilities and other terms & conditions, please visit our website www.bok.com.pk. Interested candidates may apply ONLINE latest by July 15, 2018. BANK OF KHYBER IS A EQUAL OPPORTUNITY EMPLOYER.